Melissa Hogenboog tells 20. 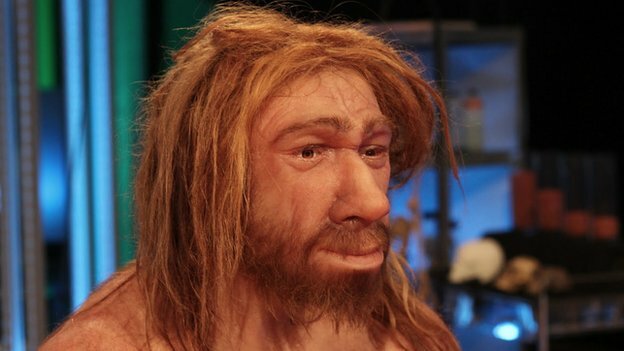 December 2013 in BBC News Science and Environment how recent study of neck bones suggests that Homo sapiens neanderthalensis had similar vocal structure than we but which other primates are missing and that he was probably able to speak like modern man, Homo sapiens sapiens. In both Creation stories Bible tells about the creation of man without any predecessors in nature - a special case so to say like other animal species each different from us. That is why Charles Darwin's Origins of Species (1859) was so shocking by suggesting that we are relatives to apes and other creatures. The first creation story tells how man and woman are together the image of God and how they were made last among all the creates on the Sixth Day of Creation. Note that he was originally a vegetarian! God saw all that he had made, and it was very good. And there was evening, and there was morning—the sixth day. Natural Sciences have given us enormous amount of information about human evolution and our background in the biosphere of planet Earth. So it is only natural for a Jewish, Christian or Muslim believer to ask at what point humans become humans in the Biblical sense. Our cousin Neander did not fulfill either of these two command. He has his own role during the last Ice Age about 200.000 - 20.000 before Christ and possible complicated history with our branch of human evolution. But when Ice Age is slowly melting he is already rare upon Earth and becomes extinct never ruling the animal kingdom, fish or birds. The latest known signs of Neadnerthals are from a cave in Gibraltar, Spain, dated to about 20.000 BC. Then it is bye bye. On contrary to this, we "wise, wise men" as we call ourselves in Latin arrive during the last Ice Age, about 100.000 before present or so, and we do fulfill both the commands of our Creator. We are truly blessed and fruitful and have spread all over the planet in multitudes of seven billion and we have taken all other God's creatures under our control. On the basis of this reading we can say that the Bible talks about "humans" with the sense of modern man, Homo sapiens sapiens. What was moving in the head of Neanderthal people, what they talked about and what they prayed - God knows! As for the story of the Garden of Eden and the six thousand years ... creation of Adam and Eve about 4000 before Christ. For me personally, the second creation story in the Bible opens a window to the wonderful world of Sumer, its histories, stories and myths. Roots in the first literal civilization on Earth. But there is more to this - a kind of archaeological and historical riddle that Neolithic studies are intensively trying to clarify. What caused the exponential growth, explosion of human culture, at about 3500 BC after such a long and nice period of hundred thousand years of leisurely hunting and gathering in the abundance of the Nature? But it is a Big Mistake to try to solve the case of human evolution and cultural evolution without taking into account our Maker. Clay Aiken - Not just another Christmas carol! Were the Wise men from the east Nabateans? All images that appear on the site are copyright their respective owners and I claim no credit for them unless otherwise noted. If you own the rights to any of the images and do not wish them to appear on the site please contact me using the comment form on any page and they will be promptly removed.